ZTE is boosting its move to dominate the Internet of Things through a deal with Intel. The company aims to use 5G as a key technology, and the two will set up an innovation lab for research and development of future key IoT technologies, including experimental verification, evaluation and research and development of related technologies. The two have previously cooperated in many fields, such as IoT access technologies, open-source collaboration, IoT platforms and solution integration. "In Intel’s vision, 5G will bring us a smarter Internet and deliver a world of connectivity in a more flexible, effective and cheaper way. We are looking towards the infinite possibilities that come from 50 billion smart devices and Intel and ZTE will make joint efforts for the IoT lab," said Rose Schooler, Vice President of Intel’s Sales Group and General Manager of Intel Global Internet of Things Sales. "We will create a new generation of IoT solutions for promoting the construction of an IoT application ecosystem as well as the development and prosperity of the IoT industry." "IoT is not only an important part of the ‘Made in China 2025’ plan and the Internet+ strategy, but also an important way to promote China's industrial advancement and economic revitalisation," said Chen Jie, CIO of ZTE. "ZTE actively explores business models, and is focusing on creating two major support platforms: an IoT ecosystem platform and capital platform. I am very pleased with the progress Intel and ZTE are making in the IoT field in joint R&D and the construction of the IoT Innovation Lab. I hope that both parties can work together to make breakthroughs in terminals, networks, and IoE PaaS. We will promote the construction of an IoT application ecosystem as well as the development and prosperity of the IoT industry by strengthening industrial collaboration, eliminating information silos, and creating industrial scale effects." ZTE has built an open connection, management, and application platform together with Intel to provide services for upstream and downstream customers in the industry chain. ZTE's Smart IoT operating system (OS) provides intelligent capabilities for IoT terminals, and the IoT management platform enables simpler equipment and user management for customers. In addition, ZTE helps partners tap the value of each "BIT" by integrating big data and cloud computing capabilities. With regards to terminals, ZTE focuses on chips, OS, communication modules, and intelligent gateways, and actively participates in industrial collaboration to create an open IoT platform for terminal hardware and software to help industry customers accelerate the development of intelligent IoT terminals. For networks, ZTE works on optimising short-range, wide area network (WAN), metropolitan area network (MAN), and core network technologies, in order to meet the different needs of IoT applications. VIA Technologies has launched an 'IoT Acceleration Platform' for the rapid development of automated ticketing, signage, and kiosk devices, highlighting the move to more fragmented developments. Rather than a general purpose platform, the ARM-based SOM-6X50 Linux board is optimised for a particular IoT application area. The VIA SOM-6X50 is an ultra-compact system-on-module that measures 6.76cm x 4.3cm. Powered by a 1.0GHz VIA Cortex-A9 SoC, it provides a highly-flexible multimedia package for a wide range of IoT automation and HMI applications. I/O and display expansion options include two USB 2.0 ports, one USB 2.0 device port, one HDMI port, one single-channel 18/24-bit LVDS panel, six UART, one CSI camera input, 10/100Mbps Ethernet, eleven GPIO and one SD Card slot. 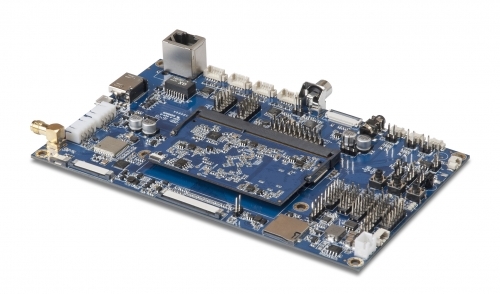 The VIA SOMDB1 carrier board multi-I/O evaluation carrier board is available. A custom baseboard can be also be developed meet specific requirements. The VIA SOM-6X50 features a Linux BSP which includes the kernel (3.4.5) and bootloader source codes. Other features include a Tool Chain to help adjust the kernel and to support the VIA SOMDB1 carrier board I/O and other hardware features. The race to provide 5G for the Internet of the Things is hotting up as Arqiva is set to test out the technology in London using kit from Samsung. This will be the first field trial of 5G Fixed Wireless Access (FWA) technology in the UK as an alternative to fibre. The preliminary 5G standard was published last week, and the UK will publish its 5G strategy 'shortly'. The trial is set to take place in the second half of 2017 in central London and will involve the deployment of an end-to-end 5G FWA network, operating in the 28GHz band. Arqiva owns the national license in the UK for this spectrum, which is also the standard band being used for 5G trials in the USA, Japan and South Korea. “Arqiva delivers millions of vital connections in the UK every day and we have been watching the development of 5G very closely. Our experience of running critical communications networks places us in a strong position, alongside a number of our operator customers, to take the lead in shaping how this country prepares itself for the introduction of 5G," said Simon Beresford-Wylie, CEO Arqiva. “5G will be a crucial pillar of the UK’s economy in the 2020s. It will provide higher speeds: 1Gbps and significantly reduced latency (delay), along with super high reliability for mission critical applications. Mobile video streaming and virtual reality will be key applications with customer usage of c100GB per month being the norm vs c1-5GB per month at present. Over time, smarter network infrastructure and an enhanced ability to support exponential scale for connectivity will open the doors to further applications across a variety of markets such as IoT, industrial applications and the full promise of autonomous vehicles. Samsung’s 5G Access Units (the base stations) will use the 28GHz millimeter wave spectrum and beam-forming to provide high-density coverage and ultra-high-bandwidth connectivity to CPEs (or Customer Premise Equipment) installed in nearby locations. These can be self-installed, reducing costs, and can bring a subscriber online in a matter of minutes. This gives 5G FWA considerable advantages over comparable FTTH or FTTB (Fibre-to-the-Home/Building) deployments in terms of service rollout times and the costs to both the service provider and the subscriber. The CPEs will be based at locations in London including Arqiva’s offices at Percy Street, London W1 and will provide ultra-high speed connectivity to multiple devices. The locations will be selected because of the wide range of customer groupings in business and residential premises. “With advanced news of 5G trials already being made in the US and Korean markets, we are really excited to be partnering with Arqiva to jointly demonstrate just how important the UK and Europe is to the 5G revolution," said Thomas Riedel, Head of Samsung Networks Europe. "The Government wants the UK to be a world leader in 5G and we're already laying the foundations for a successful launch. We are investing £1bn to boost the UK’s digital infrastructure and support 5G trials, and will shortly be publishing our 5G strategy," said the governent's Culture Secretary, Karen Bradley MP. "But industry will continue to play the leading role, and investments like Arqiva's will help make sure the UK gets the benefits of new 5G networks early on, including faster, more reliable connections, new services like connected cars and the Internet of Things." While it is not itself an embedded component, the S2U 'King Cobra' rack server highlights the best in embedded system design writes Nick Flaherty . The S2U developed by General Micro Systems (GMS) can replace up to 15U of equivalent server rack functions by using a modular and scalable architecture that is a breakthrough in electro-mechanical design. Each sub-system is optimized for maximum performance, lowest power, highest efficiency thermal profile and modular replacement in the field. Each subsystem is scalable and upgradable to lower the total cost of ownership (TCO) over the life of the system. With more and more computing resources needed in the data centre to support the Internet of Things, a compact, scalable rack that can add multiple accelerators is a key technology. The design starts with the field-removable OpenVPX single-board computer (SBC) motherboard with dual 18 core Intel Xeon E5-2600v4 CPUs and up to 1024GB (1TB) of DD4 DRAM, supported with a completely PCI Express-based storage subsystem with up to 48TB of solid state disks. The 17-inch deep short rack includes a 24 port (22x 1GigE; 2x 10GigE) Ethernet switch subsystem, a hardware or enterprise-class Cisco intelligent router, two Power Supply Unit (PSU) options with Auxiliary Power Unit (APU), and scalable add-in modules for algorithm coprocessors, sensor interfaces, additional I/O or legacy system interfaces. On-board removable smart fan trays finely manage airflow and noise using side-mounted inlet/outlets. S2U King Cobra has been awarded or has pending a total of 12 patents. “If it wasn’t unique,” said Sharfi, “the patents wouldn’t have been issued. No server company is even close to this technology, nor will be in the near future.” The patents include the Xeon CPU sockets and PCIe interconnects as well as the distributed airflow that is managed via 12 individual smart fans with tachometers, to the 100 percent only-12Vdc internal power buses that eliminate the inefficiencies of typical server power supplies with standard (and often unneeded) multi-voltage power rails and up/down converters. The OpenVPX motherboard is also designed by GMS and based upon a proven GMS compute-engine design that is used in defence applications, with the CPUs cooled via a patented version of the company’s RuggedCool technology; the heatsinks are also custom designed for maximum thermal transfer to the finely managed in-box airflow. Dual hot-swappable fan trays each contain six smart fans which blow air in/out of the system to the side—not the front/rear as in typical servers. The side-facing fans operate based upon real-time cooling needs using input from in-system sensors. The advantage of this system is that it minimizes fan noise to the server environment by keeping the fans at the minimum speed to cool the system. Internal PCIe buses move data to the subsystems, including the 12-tray drive network-attached storage array. 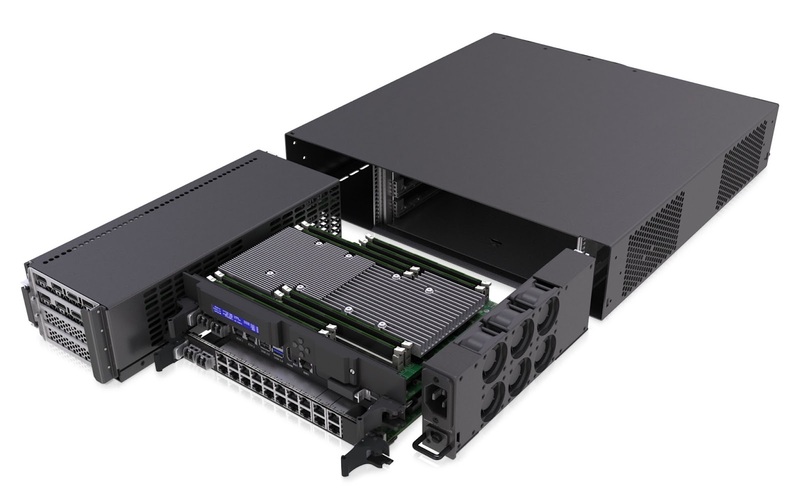 While the system supports traditional SATA and SAS SSDs (up to 4TB per tray), S2U is best used with PCIe-based NVMe drives that provide a direct PCIe path between CPU and storage, eliminating the typical server drive controllers that rob performance by converting from PCIe to another interface and protocol. The advantage of this architecture is that a hardware RAID controller isn’t needed. Instead, Intel’s CPUs support RSTe and RST2 software RAID to directly control NVMe drives without performance penalty. With 12 drive trays available, S2U supports up to 48TB of SSD storage with performance of well over 20X better than standard SAS/SATA drives. This allows the S2U to support up to 24 TFLOPS of arithmetic processing via just two Nvidia Quadro P6000 processor GPGPU compute engine modules. The S2U includes two ways to the power the system: via the three N+1 3U OpenVPX power supplies or via the add-in PSU/APU. The PSU/APU replaces the PCIe card cage and provides battery power to allow orderly suspend-to-disk or shutdown. Regardless of which option the user selects, the power supply is optimized for maximum efficiency. All S2U internal power buses are +12VDC, eliminating the need for multiple in-system power converters. This dramatically differs from traditional servers that use commodity “black box” power supplies with multiple (often unneeded) voltage outputs. S2U’s power distribution system gets the energy where it is needed without superfluous power rails. Finally, the S2U is designed to be more than a high-performance server with NAS and scalable I/O. There’s also a 22-port intelligent managed Layer 2/3 Ethernet switch with POE+ on all ports, plus an additional four 10GigE ports (SBC plus switch). Qualcomm Technologies is launching a System-on-chip (SoC) device for the Internet of Things (IoT) that combine three key wireless technologies - Bluetooth Low Energy 5, Dual-band Wi-Fi, and 802.15.4 ZigBee and Thread. The tri-mode QCA4020 has a dedicated ARM Cortex M4 processor core for customer applications aongside a low power ARM Cortex M0 core for Bluetooth Low Energy drivers and 802.15.4 control and security functions. It also supports the CSRmesh mesh networking capability which Qualcomm acquired with Cambridge Silicon Radio in 2015. A smaller dual mode chip, the QCA4024, integrates Bluetooth Low Energy 5 and 802.15.4 without the WiFi. Both use Qualcomm's Network IoT Connectivity Platform, including coexistence across technologies with pre-integrated support for HomeKit and the Open Connectivity Foundation (OCF) specifications, as well as support for AWS IoT software development kit (SDK) and Microsoft Azure Internet-of-Things (IoT) Devices SDK to connect with Azure IoT Hub. With the surge of connected devices in the home and public places, implementing security features for IoT device attacks is a challenge felt industry-wide. Qualcomm Technologies has a strong foundation in device security that stems from our experience with mobile platforms and therefore is uniquely positioned to support IoT security based solutions to help address vulnerabilities and provide advanced security features for devices. The QCA4020 and QCA4024 both have hardware-based security with secure boot, trusted execution environment, encrypted storage, key provisioning and wireless protocol security. This gives OEMs the option of replacing external security chips and potential for bill of materials (BOM) savings. These solutions can be used to integrate Bluetooth Low Energy 5, Wi-Fi and 15.4 connectivity capabilities across the Qualcomm Network range of solutions complementing portions of the product portfolio beyond IoT devices, such as the recently announced IPQ8074 and QCA6290. The QCA4020 and QCA4024 are sampling with select OEMs today and expected to be commercially available in the second half of 2017. Sequans is working with STMicroelectronics to combine the ST’s STM32 microcontroller platform with Sequans’ Monarch LTE-M chipset platform in a design kit for IoT. 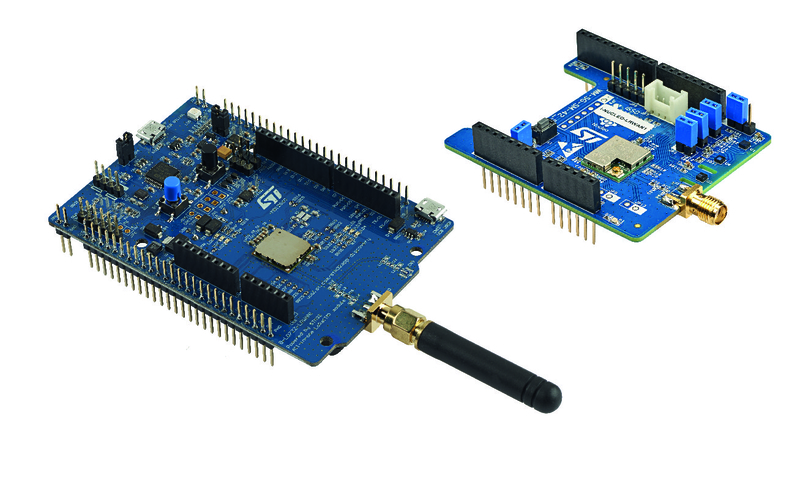 The IoT design kit simplifies device design and speeds time to market for makers of connected IoT devices using narrowband connections. These include wearables, connected healthcare devices, smart city and smart home devices, asset trackers, agriculture and industrial IoT devices, and more. Monarch is the world’s first purpose-built IoT chip to appear in the market that is compliant with the 3GPP Release 13 LTE-Advanced standard defining narrowband LTE-M and developed to support low power and low data rate applications for the Internet of Things. It provides full support for LTE-M (Cat M1) and NB-IoT (Cat NB1) power Saving Mode (PSM) and extended discontinuous reception (eDRX) to enable the long battery life needed by many IoT use cases, and it provides the enhanced coverage modes defined in the standard that extend coverage for deep-indoor and remote deployments. Monarch comprises baseband, RF, power management, and RAM, all integrated into a 6.5 x 8.5 mm package. In addition, Monarch supports advanced features such as programmable RF filtering for global band support in a single SKU, and proprietary dynamic power management technology enabling battery life of 10+ years for certain use cases. Distributor Avnet has teamed up with IBM to set up an Internet-of-Things (IoT) Joint Lab powered by the Watson supercomputer. The lab will be within IBM’s newly opened global Watson IoT Center in Munich, Germany. Avnet will use this to showcase, demonstrate, develop and sell IoT solutions from its product lines. “With almost 20 billion connected devices in the world today, the Internet of Things is rapidly becoming the biggest source of data on the planet,” said Harriet Green, global head of Watson IoT and a former chief executive of distributor Premier Farnell which Avnet acquired in October 2016 for £690m. “It often takes 10 or more partners to create a single IoT solution, and it can be a challenging and time-consuming task to find the right partners,” said Mark Martin, Avnet’s vice president, IBM global supplier executive. At the lab, clients from around the world will be able to engage with Avnet and IBM IoT experts to create working prototypes and solutions that draw on the business benefits of Watson IoT and the power of cognitive computing. They can also enhance their IoT technical expertise through hands-on, on-the-job learning in the lab. Additionally, Avnet and IBM will engage with clients on joint business opportunities. The joint lab will help enable new business models and explore innovative approaches to industry challenges. One way Avnet will achieve this is through Premier Farnell, which will use the lab to develop proof-of-concept electronic boards embedded with IBM’s Watson IoT and Bluemix services at the device level. The aim is to create a seamless experience for customers, allowing them to rapidly exploit new use cases for customers. In addition to the lab, Avnet and IBM are actively collaborating to build IoT offerings to accelerate solution development with the IBM Watson IoT and IBM Bluemix platforms. This includes IoT starter kits from Avnet’s Electronics Marketing and Premier Farnell businesses. Clients will gain access to an extensive catalog of over 150 IBM Bluemix cloud services, including the IBM Watson IoT platform, DevOps, mobile and analytics services through the Avnet Cloud Marketplace. Additionally, clients will have access to in-depth technical training on the IBM Bluemix and IBM Watson IoT Platform through Avnet’s training and education services. STMicroelectronics has launched two ready-to-use prototype boards to evaluate LoRaWAN and other Low-Power Wide Area Network (LPWAN) technologies including 6LoWPAN for long range connection sin the Internet of Things. The boards are based on the smallest and lowest-power LoRaWAN modules that exist on the market today, with a footprint not larger than 13x12mm and current consumption of 1.2µA in standby mode. The B-L072Z-LRWAN1 STM32 LoRa Discovery kit ($46.50) builds on the all-in-one open module from Murata that integrates a STM32L072CZ microcontroller (MCU) and Semtech SX1276 transceivers. The module features a LoRa modem that provides ultra-long-range spread-spectrum communication and high interference immunity whilst minimizing current consumption. Since the module is open, developers have access to the STM32L072 MCU and its peripherals such as ADC, 16-bit timer, LP-UART, I2C, SPI and USB 2.0 FS (supporting BCD and LPM). Applications use the STM32L0 HAL and LL embedded software libraries, and designers can further extend the board’s functionality choosing from expansion boards within the STM32 Nucleo ecosystem or Arduino expansion boards. The B-L072Z-LRWAN1 kit includes an on-board debugger, a 64-pin STM32 Nucleo morpho connector, an Arduino-compatible connector, and a battery socket. It also comes with access to a completely free development ecosystem that includes the MDK-ARM Integrated Development Environment (IDE), STM32CubeMX configurator and software tools, and ST’s LoRaWAN protocol stack (I-CUBE-LRWAN). The I-NUCLEO-LRWAN1 ($25.00) is an expansion board for STM32 Nucleo or Arduino boards that can be simply plugged in to quickly start work developing a full LoRa-based and/or FSK/OOK (Frequency-Shift Keying/On-Off Keying) connectivity applications. The board features a LoRaWAN module from USI together with an STM32L052T8 MCU and Semtech SX1272 transceivers. The USI module comes pre-loaded with an AT command stack that helps streamline development and saves programming. The I-CUBE-LRWAN stack is available free of charge. As an extra bonus, to aid development of Internet-of-Things (IoT) applications, the I-NUCLEO-LRWAN1 board is also equipped with ST’s LIS2DS12 3-axis accelerometer, LPS22HB MEMS pressure sensor, and HTS221 humidity-and-temperature sensor. Both boards are LoRaWAN-certified and fully compliant with wireless regulations in the US, EU, Russia, India, and other countries using the 860-930MHz frequency bands. In addition to the industry-standard protocols, they also support proprietary LPWAN protocols for long-range connection of IoT devices like smart meters, alarm systems, tracking devices, positioning devices, environmental sensors, and activity sensors. The B-L072Z-LRWAN1 Discovery kit and I-NUCLEO-LRWAN1 are ready for distributors to order now, and will be available via st.com by the end of this month. Microsoft has picked up another potentially large Internet of Things (IoT) deployment for its Azure cloud service in a deal with Ingenue. Ingenue will use the Azure IoT Hub for its end-to-end IoT networks using its Random Phase Multiple Access (RPMA) low power network technology. This uses globally available spectrum for M2Mand IoT long range links. It enables devices to connect more efficiently and cost-effectively in both the uplink and downlink and requires less towers to provide coverage to large areas (1:10 to 1:30 radio towers for RPMA vs. cellular) and has been used in 38 networks so far. Azure IoT Hub supports a broad set of operating systems and protocols, giving IoT solution developers the ability to quickly connect, monitor and manage IoT assets. Ingenu’s Intellect RPMA device management platform, will integrate with the Azure IoT Hub to provide secure bi-directional communication between RPMA-enabled devices and web applications. The solution will further enhance the processing of collected IoT data using Azure services such as Stream Analytics, SQL Database, Event Hubs, App Service, and Power BI Embedded. “This integration enables complete network visibility and an end-to-end robust data management solution,” said Sam George, Director, Microsoft Azure IoT at Microsoft. 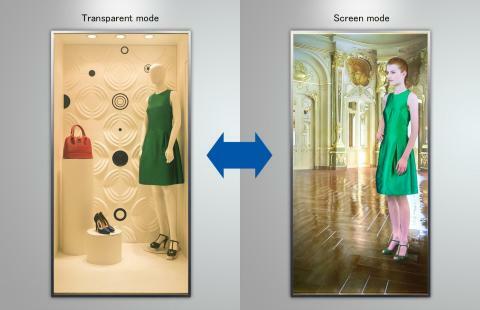 Panasonic will start shipping its high image contrast transparent screen that enables the use of glass, such as shop windows, as digital signage next month. The system includes a unique glass (XC-CSG01G) with a high contrast light control film placed in between two sheets of glass, which when voltage is applied changes from the screen mode to the transparent mode, as well as the XC-CSC01G-A1 control box. 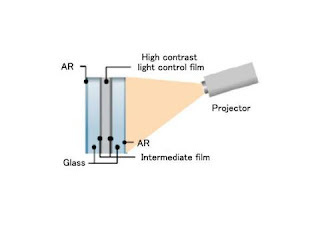 Traditionally, images have been projected onto cloudy white, electric switchable glass, but this type of glass was incapable of displaying high contrast images due to image degradation caused by external light. 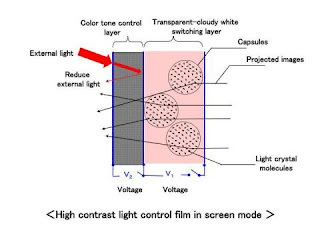 Panasonic has combined glass with a high contrast light control film, which is comprised of a transparent-cloudy white switching layer containing special polymers and capsules and a color hue control layer. The color hue control layer will absorb a great deal of external light in screen mode, thereby significantly reducing image degradation and bringing to life high contrast images on par with digital signage, even in brightly lit environments. 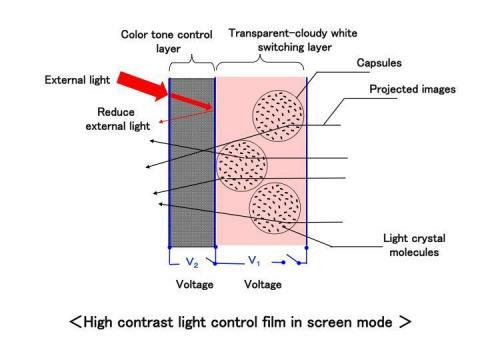 By adjusting the colour hue control layer's permeability depending on the level of lighting in the installation environment, the screen can maintain the same level of high contrast in environments of varying brightness. In brightly lit spaces, it can reproduce images with rich blacks, and in dark environments, it can reproduce high contrast images even with a compact projector. Numerous screens may be combined horizontally, so for example, a 221-inch (16:9) screen measuring 4.9m wide and 2.75m tall can be created. The control box will switch between transparent and screen modes, control the projector, and turn ON/OFF the lighting in the exhibition space behind the glass. Researchers at the University of Bristol have developed an ultra-low power switch that operates from a few picowatts, allowing sensors in the Internet of Things (IoT) to save power and cut standby power to zero. The voltage detector chip uses five picojoules of energy and requires only around half a volt to operate, which can be delivered directly from a sensor such as a photodetector. This would cut standby power to zero. The research group are providing samples of their chip to companies to use, and the team have demonstrated a TV with no continuous draw of power during standby by using a voltage detector that is powered up at a distance, directly from the infrared signal of a standard TV controller. “The ultra-low power UB20M voltage detector provides sensing that is continuous and free," said Dr Stark, Reader in Electrical & Electronic Engineering in the Department of Electrical & Electronic Engineering. "This is because it is able to respond to minute quantities of power from unpowered sensors. No battery or other power is needed for the device to stay alive and listening, and battery maintenance is therefore reduced or not needed. We are now actively seeking commercial partners to use the voltage detector chip in their product, and would welcome companies to get in touch." A $1.5m collaborative project is set to develop and produce a flexible, solid-state lithium battery that is just 0.25mm thick. By integrating an ultra-thin flexible ceramic substrate, more embedded design options open up. The FlexTech consortium, set up by the SEMI semiconductor industry association, is working with ITN Energy Systems of Colorado on the 15 month project to produce a 500mAh cell no larger than 50 x 27 mm and just 0.25mm thick, says Brian Berland, chief science officer at ITN. The ceramic substrate is produced by ENrG of Buffalo, NY, which licenses the technology from Corning. Market researcher Gartner is predicting that 8.4 billion connected things will be in use worldwide in 2017, up 31 percent from 2016, and will reach 20.4 billion by 2020. Total spending on endpoints and services will reach almost $2 trillion in 2017. Regionally, Greater China, North America and Western Europe are driving the use of connected things and the three regions together will represent 67 percent of the overall Internet of Things (IoT) installed base in 2017. The consumer segment is the largest user of connected things with 5.2 billion units in 2017, which represents 63 percent of the overall number of applications in use (see Table 1). Businesses are on pace to employ 3.1 billion connected things in 2017. "Aside from automotive systems, the applications that will be most in use by consumers will be smart TVs and digital set-top boxes, while smart electric meters and commercial security cameras will be most in use by businesses," said Peter Middleton, research director at Gartner. In addition to smart meters, applications tailored to specific industry verticals (including manufacturing field devices, process sensors for electrical generating plants and real-time location devices for healthcare) will drive the use of connected things among businesses through 2017, with 1.6 billion units deployed. However, from 2018 onwards, cross-industry devices, such as those targeted at smart buildings (including LED lighting, HVAC and physical security systems) will take the lead as connectivity is driven into higher-volume, lower cost devices. In 2020, cross-industry devices will reach 4.4 billion units, while vertical-specific devices will amount to 3.2 billion units. While consumers purchase more devices, businesses spend more. In 2017, in terms of hardware spending, the use of connected things among businesses will drive $964 billion (see Table 2). Consumer applications will amount to $725 billion in 2017. By 2020, hardware spending from both segments will reach almost $3 trillion. Total IoT services spending (professional, consumer and connectivity services) is on pace to reach $273 billion in 2017. These are dominated by the professional IoT-operational technology category in which providers assist businesses in designing, implementing and operating IoT systems. However, connectivity services and consumer services will grow at a faster pace. Consumer IoT services are newer and growing off a small base. Similarly, connectivity services are growing robustly as costs drop, and new applications emerge.